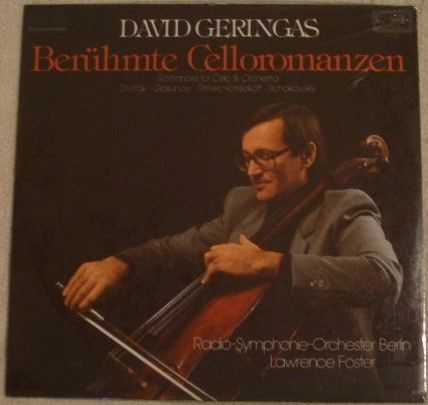 33rpm LP Record of ROMANCES FOR CELLO AND ORCHESTRA (Beruhmte Celloromanzen), featuring David Geringas on cello, playing works by Tchaikovsky, Dvorak, Rimsky-Korsakov and Glazunov, accompanied by the Berlin Radio Symphony Orchestra conducted by Lawrence Foster. It was issued on the Eurodisc Stereo Digital label in 1980. German pressing. Catalogue number: 201867-366. Still sealed. The record itself is graded mint, having never been played. The outer sleeve is graded close to mint with no more than light handling and storage wear. The whole is still sealed in the manufacturer's shrink wrapping.